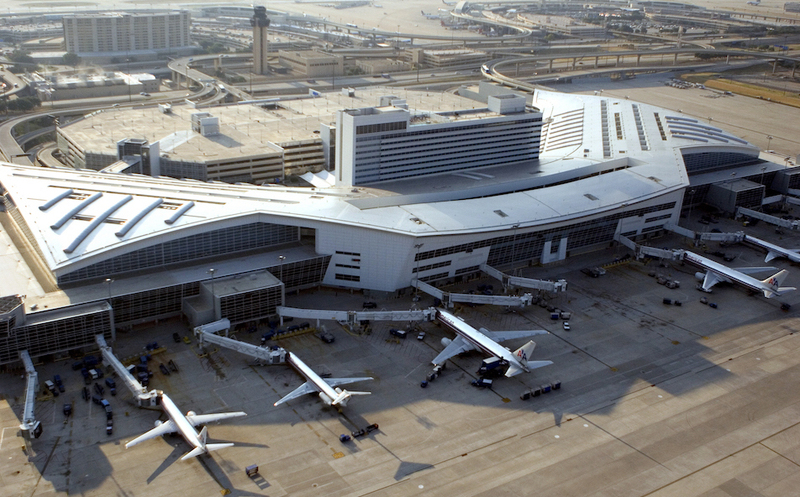 DFW Airport’s Terminal D, the sprawling aviation facility’s newest terminal. Think of the biggest Texas things that emit climate-warming carbon dioxide and the usual sources – coal-burning power plants, oil refineries and chemical plants – come to mind. Another type of sprawling industrial complex gets less attention: airports. A new status for the state’s biggest, Dallas/Fort Worth International, could change that. The label, the highest given by the nonprofit Airport Carbon Accreditation, means the world’s third-busiest airport in aircraft operations – and the 10th biggest globally in passenger traffic – is counted as having emitted no net CO2 for a year. There’s some bookkeeping involved, since absolute carbon neutrality is nearly impossible given current technology, the accreditation group acknowledges. But the group says that through a combination of lower onsite emissions and emission-reduction credits earned offsite – by investing in renewable energy, for example – DFW has met the standard. That’s further than any North American peer has gone in making the ground-based part of air travel climate-friendly. The airport reports cutting its CO2 emissions per passenger by 29 percent since 2010, due in part to a 15 percent passenger-traffic increase. DFW says it has reduced energy costs by 38 percent and absolute CO2 emissions by 18 percent in the same period. It buys 100 percent renewable electricity and makes some solar power onsite. DFW defines big; plopped on nearly 27 square miles between co-owner cities Dallas and Fort Worth, it covers more area than Manhattan. It’s the home base of American Airlines. Energy for and emissions from buildings and operations, plane-servicing vehicles, fuel systems and other sources count in an airport’s carbon footprint. CO2 emissions from aircraft engines don’t count because airports don’t control them. Neither does anyone else; there’s no limit on jet engines’ emissions, although this month the EPA took the first step toward possible future regulations and the industry is close to adopting guidelines. It’s also discussing climate change’s effects on the physics of flight. Air transport overall emits about 2 percent of worldwide greenhouse gases, the United Nations says. International goals are to halt emissions growth by 2020 and halve them from 2005 levels by 2050. But the goals are soft; specifics on air transport were left out of the climate agreement reached in Paris last December. Randy Lee Loftis, an independent journalist in Dallas, is senior editor of Texas Climate News.